The home improvement titan has a lot to prove on Nov. 15. Home Depot (NYSE:HD) is set to post third-quarter earnings results on Nov. 15. At its last quarterly check-in, the retailer managed record profits even though sales growth slowed down. Can investors expect similar results this time around? Here are the key trends for investors to watch in this week's results. Home Depot's comparable-store sales growth has been trouncing not only the broader retailing industry, but also rival Lowe's (NYSE:LOW). Comps at Home Depot rose by 5% last quarter while its chief national competitor saw just a 2% uptick. Three months ago CEO Craig Menear and his team projected that comps will rise at that same market-thumping 5% pace for the full fiscal year, marking a slight slowdown from 2015's 7% spike. Growth in the professional customer segment will be key to achieving those gains. Spending by this group helped push Home Depot's big-ticket purchases -- those that amount to greater than $900 -- up 8% last quarter and will likely play a leading role in growth going forward. Within the comps results, keep an eye on customer traffic levels. Last quarter's 2.2% rise was below the 4% pace that Home Depot enjoyed in each of the last two fiscal years. If traffic gains slip much further, it will likely be hard for the company to reach its 2016 sales growth goals. Revenue slowdown or not, Home Depot expects to produce excellent financial returns this year. Earnings are up 11% over the last six months, which has helped push bottom-line profitability up to 9% of sales from 8% in the prior-year period. 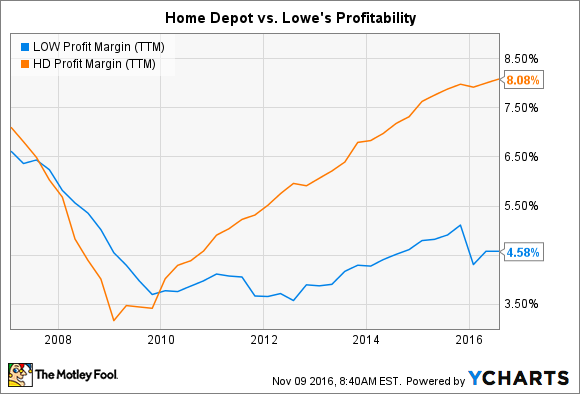 The performance gap on this metric is even starker than the difference in sales growth: Since the end of the housing crisis, Home Depot's net profit margin has more than doubled and is far above that of Lowe's. LOW Profit Margin (TTM) data by YCharts. Executives raised their full-year profit guidance in each of the first two quarters and now see earnings improving to $6.31 per share, representing a 16% jump over last year's result. And since the company aims to deliver 50% of earnings directly back to shareholders in the form of dividend payments, income investors can expect 2017's dividend hike to closely track this profit growth. Judging by the stock's weakness this year (it is one of the worst-performing members of the Dow), Wall Street isn't bullish about Home Depot's short-term growth potential. But management sees plenty of reasons to expect years of above-market growth ahead. The company is stealing market share in the professional segment while pushing into the growing maintenance, retail and operations niche. Together, these areas give Home Depot a $550 billion addressable market in the U.S. and allow for lots of room to improve on its current 15% share. Meanwhile, Home Depot is one of the few national retailers that's doing more than just playing defense on e-commerce. It boosted online sales by 19% last quarter as the digital sales channel reached 6% of the business. Home Depot's long-term target calls for it to pass $100 billion of annual sales sometime in the next 18 months or so while raising its return on invested capital to an incredible 35%. For that to happen, the retailer needs to keep growing at around a 4% comps pace. Executives don't promise that it will be a steady, easy climb. In fact, they expect bumps along the way. "We are instituting a high degree of change across many areas of the business," Menear told investors in August. "With this amount of change there will be learnings and opportunities to refine the process along the way."